The following catchers are still available in some season-long, daily and weekly fantasy baseball leagues. A red-hot start to June raised Saltalamacchia’s batting average to .262 and OPS to .781 as of the end of the month. Saltalamacchia, now 28, has not hit above .235 since 2008 and has never had an OPS above .750. Saltalamacchia’s 31 RBI and 25 runs are almost halfway to his career highs. He has eight homers. His numbers make him a top choice as a waiver wire catcher. Saltalamacchia hit 25 homers in 2012 but also had a .222 batting average. Saltalamcchia, a switch-hitter, has an OPS against righties of .841 as opposed to .589 against lefties. His career mark against lefties is .587. Saltalamacchia’s OPS at home is .912 vs. .632 on the road, but those splits were more even in his previous years in Boston. Saltalamacchia’s 2013 BABIP is .395. Castro, the tenth pick in the 2008 amateur draft, has been hampered by injuries in his career. 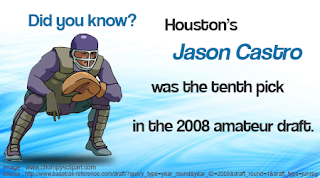 Finally healthy in 2013, he has taken over the number 3 spot in the Astros lineup and has been DH 10 times as the Astros try to keep him active when he is not catching. Castro hit .292 in May with six homers and 13 RBI. Though he struggled in early June, Castro was hitting .269 with 11 homers, 27 RBI and 33 runs as of press time, making him a decent choice if you are looking for a catcher. The left-handed Castro’s OPS against righties is .847 as opposed to only .638 against lefties. (His career mark against lefties is even lower - .413.) Castro has a home OPS of .900 as opposed to .700 on the road. One would not think that a team with Carlos Santana would find plenty of at bats for their backup catcher. But with Santana playing more than a third of his games at first base or DH, Gomes made 13 starts in May, during which he hit .370. On May 20, Gomes hit two homers against Seattle, including the game-winner in the tenth inning, and followed that up with two hits and another homer the following day against Detroit. After that , Gomes began to see more time in the starting lineup. Through the end of June, Gomes had caught 11 games in the month and served as DH once Even after a slow start in June, Gomes was hitting .268 with six homers in 112 at bats and an .806 OPS. Gomes may be a good choice in daily fantasy baseball leagues. I am in a really unique fantasy league that was started in 1991 (my dad's league). We use a points system and players that you add via a bonus move come to your team with their points, so lets say my drafted catcher has 90 points and I use a bonus move on a catcher with 100 points, I actually pick up 10 points in the standings. Thing is, you only get to make 3 moves after the draft (10 man league, draft 2 of every IF pos, 6 OF and P). I had to drop Miguel Montero because he is terrible this season and I picked up Jason Castro. I really hesitated because I have Brian McCann but he is on my backup team, so his points do not count towards standings until he has more than Montero/Castro. My question is, if you could only make 3 bonus moves all season, would you have "wasted" one on a catcher? That sounds like a very interesting league set-up. Usually I doubt I'd waste one of three moves on a catcher, especially when I was holding a player that should be among the better options. However, Montero has been so bad (even with his recent success he still has a long climb to respectable) that the move from Montero to Castro seems significant. How many points did you gain? Assuming that it was one of three moves you could make that improved you the most I'd say well done.